Some people tried before to keep on one page all the local news. They never lasted long since it’s a lot of (boring) work to keep updating many sources. But why do that when you can use automation to get the news flowing? That was the main idea of the site, to fill to sidebar with an always flowing list of local news from multiple sources. There is a division between regular news (publications) and political news (parties). 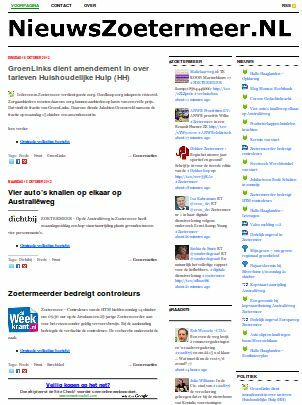 The middle bar is filled with the latest tweets about the city, again in two divisions: #zoetermeer (city), #raad079 ( city council ). In this way visitors can -apart from the ‘formal’ news- also take a peek at what is trending. The biggest challenge was how to fill the main content area since I wanted as much automated as possible. I don’t have much time to keep a site like this updated. Eventually the decision was made to -for now- fill it with the main news from all the sidebars. Layout mostly comes from the Cutline Theme. Usually I go for basic and very clear looks so the focus is on the content rather than on all the ‘extra’ thingies around. This theme did this for me.The sidebar look works nicely with two columns as well. edit: I would not recommend using this theme since it’s not updated for newer version of WordPress. To get content I use the WordPress plugin Feedwordpress which can handle multiple feeds. Every feed is pulled to it’s on sub-category. I.e. all local publications are categorized under ‘feeds -> ‘ This way it’s easy to customize the themes. The front page is a separate category. This way if an editor adds a news item to the front category it’s published. Takes about 5 seconds, so good for fast maintaining to most important items. One thing that is important is not to use the internal wordpress cron, but a real cron. The reason -of course- is that Feedwordpress will start the pull feeds when the visitor is waiting for a page. With every feeds the time to wait increases. In the near future I like to have more control about how feed content behave. One big problem is that many developers or suites from other sites don’t know how to present clear RSS to end users and usually editors don’t even know that this feature exists. The means that sometimes weird content is pulled from the source. What the Feedwordpress plugin really is missing is a good filter feature. There are some extension, but it’s just not good enough to be really useful with unreliable feeds. This article hopefully inspired how you can build a full content blog without much upkeep and how you can use multiple feeds from multiple sources. This may be handy for portal administrators or what to think about an intranet where in one view you can offer your peers everything they need?